Planning ahead for potential storms and emergencies will serve you well. Here’s what we learned from Hurricane Iselle (July, 2014) about how to prepare for a hurricane. Hurricane Iselle made landfall on the Island of Hawaii. The initial path of the hurricane was expected to take the storm right over the top of my little town. Ack! Turns out, our big mountains—Mauna Kea and Mauna Loa—had other ideas. Instead of following that path, the storm slammed into the southern part of our island then veered off to the west. It could have been so much worse. Emergency response teams and community members worked together to clear roads and help their neighbors. As it is, there are still nearly 9,000 residents without power in the hardest hit areas. One community is completely isolated with no way in or out. Watching this unfold has been a lesson in disaster preparedness. And for all of my ideals of becoming more self-reliant, I have to say: I was not as prepared as I should have been. If you haven’t looked at your emergency essentials lately, take some time to do so! The key word in prepping for disaster is…prepping! Here’s how to prepare for a hurricane and other disasters, based largely on what people found lacking in the aftermath. We had (I think) plenty of water. Our fresh water supply consisted of 12 gallons of drinking water in glass containers (my empty half-gallon ball jars came in handy) as well as a 55-gallon container full. We kept the jars inside with us, and the 55-gallon container was outside, secured to the house. In addition, we did finally manage to cap our 10,000-gallon catchment tank so that we captured some of the rain from Iselle. We would have needed to boil it for drinking purposes, but it was nice to have that backup at the ready for personal care, cleaning, and flushing the toilet. Turns out, we didn’t lose access to running water, but the remote southern part of our island is facing a real problem as evidenced in the video below. Just in advance of the storm there was a rush on bottled water and some serious (shameful!) price gouging as people began prepping for disaster. Here’s the thing. Those shoppers still had running water at home! They didn’t really need to buy water; they were really buying the container. For the love of Pete, people. If you don’t have extra containers on hand to fill, go get a few collapsible water containers for your emergency kit. They won’t take up much space and it’s a simple matter of filling them from the tap before the storm hits. I admit, I was on the fence about boarding up our windows. Was it really worth the effort? I’d say yes. Some thought it was overkill, but the peace of mind it brought was priceless. Sure, if we’d taken the brunt of the storm we might have lost our roof. But if something did hit our windows, the glass would (hopefully) remain outside. There was an unexpected psychological bonus, too: The boarded windows helped to reduce the noise of the strong winds, making is seem less worrisome. With our recent move, we’ve been operating without an oven/stovetop for the past month. This meant that our propane tanks were both full and ready and my gas cookstove and the gas grill were both at the ready. We have cast iron pots and pans (fine for cooking on open flames) as well as a manual can opener, meaning that we’d be able to actually use the food we have stashed in the emergency kit. While many folks were making mad dashes to the grocery store to stock up on emergency essentials like bottled water and supplies, and waiting in long lines at the gas station, we were pretty comfortable just sticking it out at home, knowing that we’d be okay. That’s not to say that there’s not room for improvement. While I typically keep a pretty solid supply of things like dry beans, rice, and canned goods on hand, with our recent move and incomplete kitchen setup I’d allowed that to dwindle. I didn’t want to have to figure out where to store all of that in the midst of finishing the kitchen, so I found myself standing in line at the supermarket to beef up our pantry. On top of that, my garden is skimpy so far, so I couldn’t even count on heading out there to harvest the potatoes or carrots that might survive the storm. 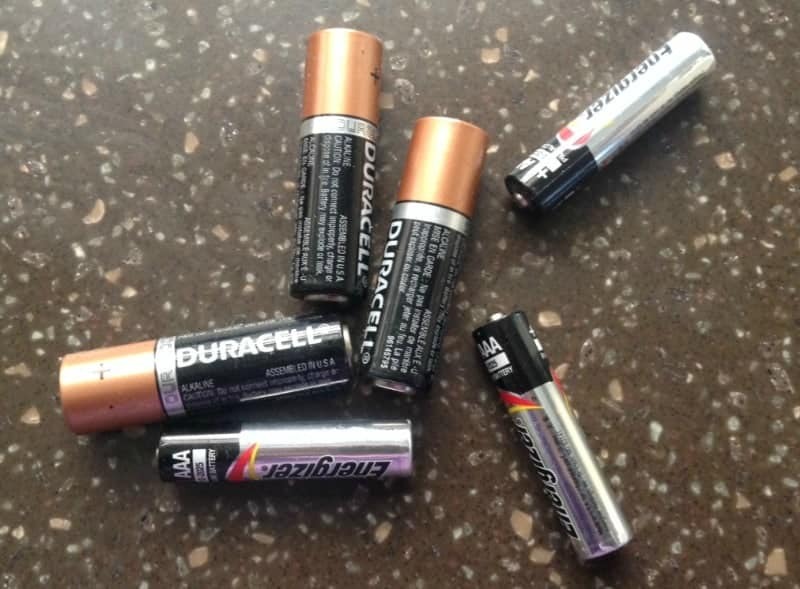 While we have a good collection of batteries on hand—and could find them!—a fair number of them had gone dead. We don’t use many batteries around here, so we apparently don’t cycle through them fast enough. Since our primary use for batteries is to power flashlights, it seems like switching to solar lanterns and flashlights would be a really good solution. UPDATE: High on the list of requests from the people who are still in recovery mode after the hurricane: D batteries. With the rush for supplies, there’s a shortfall of this size battery at island retailers. My own experience with batteries that had gone dead in storage make me think that in addition to a solar flashlight, a solar battery charger would be a good idea. Thank goodness we didn’t need them, but our medical supplies are pretty sparse. I need to work on improving that aspect of our emergency essentials. We are bordered on one side of our property by a grove of very large eucalyptus trees. These trees are not ours to maintain, but the neighbors are friendly. They’d probably be more than thrilled to have us do a little preventative maintenance on them. We also have several very tall Norfolk pine trees looming over our house. 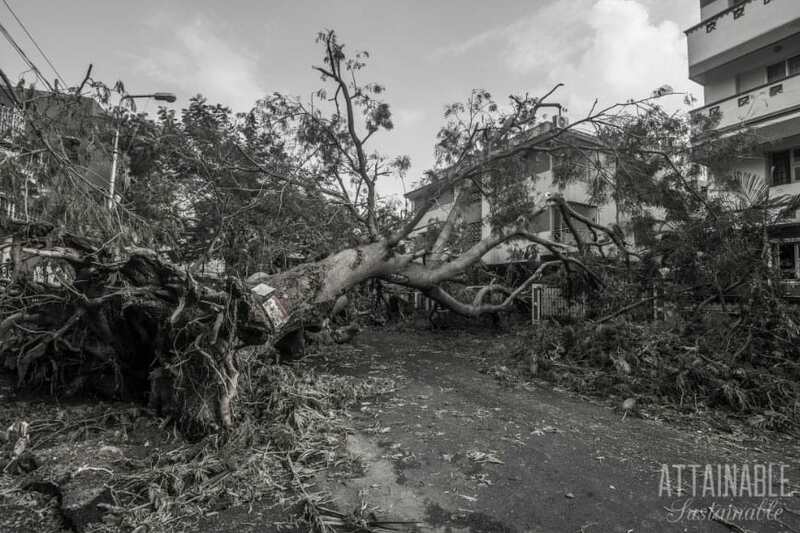 Much of the damage occurred in the Puna district as a direct result of trees falling. These were primarily non-native, invasive trees. While trimming dead and dangerous limbs is certainly a good idea, this is a reminder that we need to be mindful of the species that we introduce, too. I highly recommend that you visit Frugal Kiwi to learn how to create a do-it-yourself emergency preparedness kit. 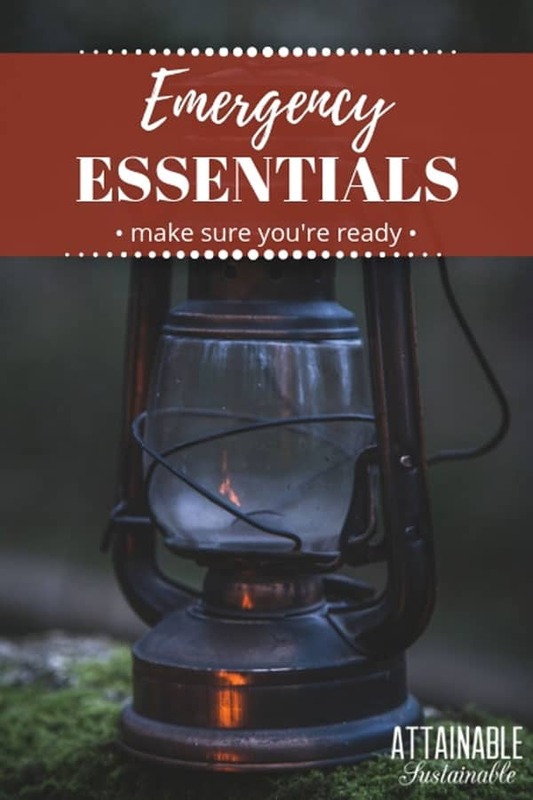 Melanie has compiled a comprehensive list of emergency essentials to keep on hand, with an eye on doing it inexpensively. Smart girl. If you’re trying to figure out how to boost the amount of food you have available for an emergency, go read How to Start a Food Storage Plan on $10 a Week at the kitchn. Good advice there. While we—thankfully—have had only minor inconveniences due to the storm, others have been devastated. Watching things unfold for our neighbors to the south has been nothing short of inspirational. The residents of the Puna district on the Island of Hawaii are still reeling from the impact of Hurricane Iselle. The community has pulled together to weather the aftermath, clearing roadways, pooling emergency supplies, and helping one another. This weather event is — after the fact — an opportunity to assess how well equipped each of us is with our emergency essentials. Of course, there’s frustration, too. In the weeks after Iselle, certain requests from those hardest hit have been repeated over and over. I think it’s smart to take a look at those requests and figure out how they fit into our emergency preparedness plans. Are any of these things items that you’ll need in an emergency? Is there a way to be sure you’ll have access to these things instead of being at the mercy of overtaxed relief workers? This seems to be the number one request from the people who are still waiting for electrical power. Requests for ice are a bit frantic feeling. While residents from outside the affected region are working to fulfill the requests by freezing and delivering blocks of ice, it’s been tough for aid workers to get it to those who need it. I have to admit, I’ve been surprised by the call for ice. Our plan for lack of refrigeration in case of emergency is: Eat ice cream first, then refrigerated items, followed by freezer items, then move to food that does not need refrigeration. Know a storm might hit? Dig through the recycle bin and fill clean plastic containers or milk cartons with water and stash them in the empty spots in your freezer. These blocks will help you keep your perishables cool until you can use them. After several days without power, you may be faced with some perishable food that’s threatening to go south. This would be a stellar time to fire up the barbecue and invite the neighbors for dinner. You’ll prevent food waste and help to create a sense of community. If you’ve got a freezer full of meat that you’re going to lose without power, instead of trying to keep it on ice, go old-school. Your emergency stash includes some salt, right?? Instead of waiting and hoping for someone to arrive with ice before your steaks go bad, use an old-fashioned salt curing method to cure them. If the weather is quite warm, you can slice your thawed meat and dry it. Beef jerky is common, but turkey and fish jerky is possible, too. My friend Angela was caught with a freezer full of perishables when she lost power for a week. She pulled out her pressure canner and saved them that way using her gas stove. This is—in my mind—the most crucial aspect of surviving a disaster and should be at the top of your emergency supplies list. Water is necessary for hydration, of course, but also for hygiene and cooking some of our staple storage foods like rice and beans. The recommendation for emergency water storage is one gallon per person per day. Don’t succumb to the long lines at the supermarket in order to buy bottled water, though. Your money is going to be better spent on collapsible water containers that can be filled right from your tap before outages occur (and used in subsequent emergencies). Think about it. If you know ahead of the game that an emergency situation might arise, you’ll still have access to water. It’s the containers that so many people are waiting in line to buy. If you’ve got a collection of canning jars, pull those out and fill them. And speaking of containers, is there a way for you to capture storm water? A big barrel, maybe? Of course, you’ll want to fill your bathtub with water for dish washing, toilet flushing, and bathing. You’ll also want to consider adding a LifeStraw to your emergency supplies. This allows you to turn questionable water into drinking water. If you’ve filled your freezer with clean jugs of ice for chilling, once thawed, use those for drinking water along with any other water you’ve managed to store. If you’ve got access to water but aren’t sure of its purity, pull out that LifeStraw. D batteries in particular are in short supply after Hurricane Iselle, though I suppose batteries of every shape and size would be useful emergency essentials. As people are entering week number two with no power, flashlight batteries are running out. Within reason, you can stock up on batteries in your emergency supplies kit. The trouble is, batteries in long-term storage tend to go dead. Instead of hoping that batteries in storage are still viable, though, a better option might be to invest in a solar battery charger. This means batteries are available for powering a variety of gadgets. The other option is to switch over to solar gadgets. There are solar flashlights, solar lanterns, and even a solar powered radio/flashlight that will also charge a smartphone. If you find yourself without power for an extended period, limit your use of battery operated gadgets to only what’s necessary. Sun goes down? Time for bed. Mommas and daddies are worried about their babes in an emergency, of course. But don’t panic, folks. 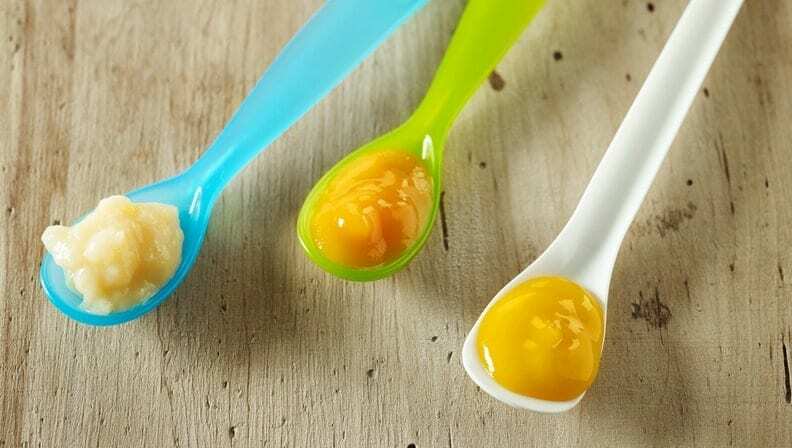 While jarred baby food is part of our modern tapestry and it may be all some parents know, it’s a fairly new invention. Stock up on potatoes, sweet potatoes, butternut squash, apples, and carrots. 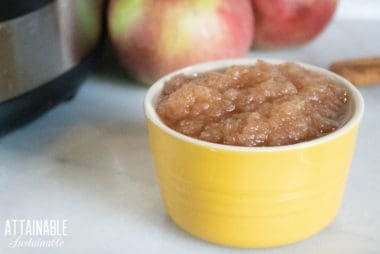 These items will keep for weeks (or months) without refrigeration and can be easily transformed into “baby food” made from your emergency supplies. Simply peel and cook until they’re very soft, then mash with a fork. If you’ve stored grains like oats, rice, and barley in your emergency stash, these become excellent baby food replacements. Fresh produce like bananas, avocados, mango, and peaches are also easily mashed. And if you’ve got chickens or ducks, don’t forget eggs as a source of food for your little one. Disposable diapers are bulky to store, not to mention expensive to buy. It’s no wonder that people have run out already. And really, there’s no easy solution for this dilemma. If you use disposable diapers on your babe, you’ll want to pick up at least a few extra packages of diapers to prepare for a hurricane. You should also think about keeping some diaper pins on hand. If you run out of disposables, you’ll need a way to secure makeshift diapers in place. If you use cloth diapers on your babe, you’ve got a different problem: washing dirty diapers when water is scarce. One thing you can do is to have a box of diaper liners on hand. These allow you to lift away and flush big messes, leaving you with a diaper that’s easier to clean. If you find yourself out of your usual disposable diaper stash, it’s time to get creative. While not the ideal solution (we’re talking about emergency situations here, after all), old kitchen towels and t-shirts can be pressed into service as cloth “diapers” as long as you’ve got pins to secure them. After a couple weeks without power, people are itching for a hot meal. It’s not critical when preparing for a hurricane or longterm power outage, but a hot meal can go a long way to avoiding the crankies. Consider making up a big pot of soup or stew or beans that can easily be reheated. Then, of course, make sure you have a way to warm food. We have a small gas barbecue and a gas burner to use in case of emergency. You’ll also need to make sure that you have several small propane canisters or that your larger propane tanks are full. In a pinch, you can use a gas barbecue to heat food and water in pots, but it’s probably not as efficient as a simple gas burner. 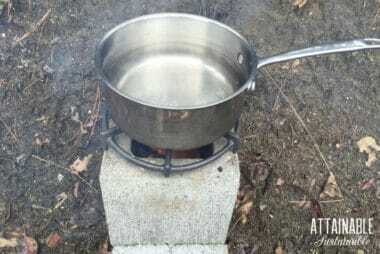 If you’ve got the materials, you could also cobble together a rocket stove or solar oven. The admonition to fill your vehicle’s gas tank before a storm hits is a good one. 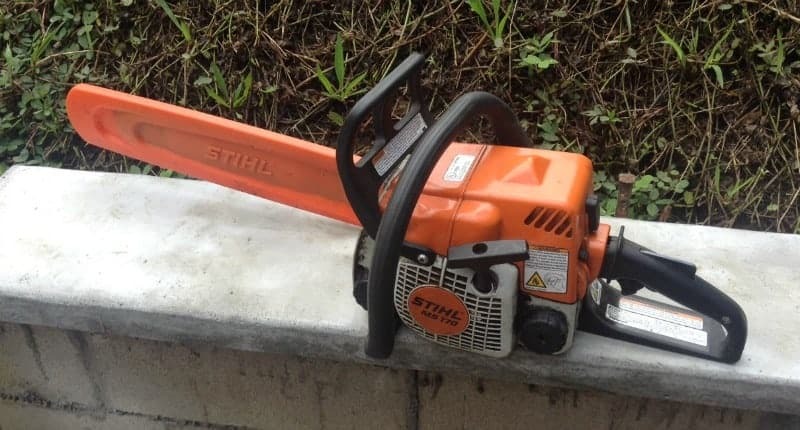 It gives you the opportunity to be mobile as the roads allow, but with a simple siphon, that gas becomes a valuable commodity for filling chainsaws to clear roads. With so many trees down in the hurricane, chainsaws have been hard at work. It’s no wonder that the blades have dulled and people are putting out the call for chainsaw sharpeners. Add a couple to your stash of emergency supplies. This is by no means a complete emergency preparedness list, but rather an observation about what people are asking for in the aftermath; the things they neglected to have on hand or prepare for. It’s something we can all learn from, I think. If you need ideas on how to create a thorough DIY emergency preparedness kit, I suggest you check this one out. Have you weathered an extended time without services? 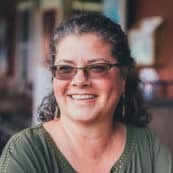 What items are at the top of your “how to prepare for a hurricane” list? Flashlights. Get hand crank flashlights. You can charge them anytime, like in the middle of the night. That’s what we’ve had in our emergency stash. Unfortunately, one (the one with the radio!) wouldn’t work at all and the other only lit up when being cranked. It had probably been close to a year since we’d tested them, though. Lessons learned! That bit about the crashing trees is dead-on… We had a tree fall down in a very strong wind (not even a hurricane!) simply because it had rotted a bit and it really makes one realize how many trees surround the house. A tree can be good at blocking wind/snow/providing shade without being close enough to cause roof damage! Yes! I think it’s hard sometimes for people to imagine just how BIG that little potted tree will get! I’ve had a recent move myself, and not sure I’ll be staying in the new place for long — both of which have caused me to let some of my usual good hurricane season preparations lag, so I’ll be on the way to sort out and stock up over the next few days thanks to this reminder. Solar powered/handcranked flashlights seem like a really good idea too, as does a hand cranked radio. Glad your family came safe through Iselle.